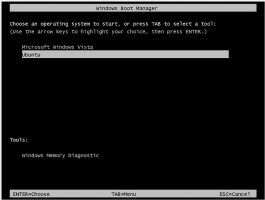 Many people are interested in trying Ubuntu – a popular Linux distribution – but are unfamiliar with terms such as “partition” and “dual-boot” and how to perform those actions on their systems. Although partitioning a drive is reasonably simple, it’s not always the best or easiest choice to make when deciding to install Ubuntu on your PC. Wubi Installer is an extremely simple and safe way to try out Ubuntu. After downloading Wubi Installer from the official website, just double click the executable like any other Windows program. You’ll be presented with a setup screen that automatically selects your local drive (C: for most users), installation size, desktop environment (Ubuntu), and language. You’re left to fill in a username for the OS and a password if you wish to have one. The username must be all lower-case for the installation to work correctly. Now all that’s left to do is click Install. The appropriate version of Ubuntu will be downloaded and installed on your hard drive in a complete and separate folder within your Windows installation, which means that there’s no need to mess around with partitioning your hard drive or using a boot loader. If you want to use an older Ubuntu installation (or simply don’t feel like waiting for Wubi to download Ubuntu) you can download any version of an Ubuntu ISO file and place it in the same folder as the Wubi.exe before you run the program. Wubi will recognize the ISO and use it for installing the operating system so there’s no wait for downloading. Following the setup instructions for Ubuntu is easy and will only take a few minutes. 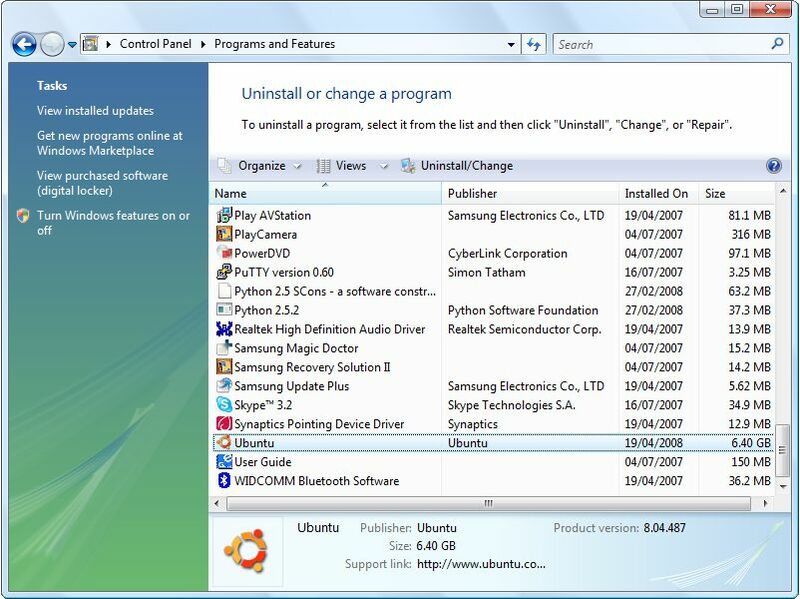 From this point on, you will be given the option of choosing to boot into your Windows installation or Ubuntu whenever you turn your computer on. There’s a short timer that will automatically boot into Windows unless you use the navigation keys to make your choice of operating system to load up. While Wubi is impressive, it’s not perfect. Wubi’s Hibernate and Suspend modes do not function yet, and may even be removed in future releases. Having the ext3 file system settled within Windows’ NTFS file system has also been problematic for people who have hard rebooted their computers. Lastly, you may experience slightly slower disk performance, especially if you install Wubi on an older, slower machine. It’s very unlikely that you’ll notice a difference, but the best way to avoid problems with disk performance is to make sure to allocate enough space in the Wubi setup screen, and defragment your entire hard drive before installing. It’s recommended that you set aside a minimum of 10 gigabytes for a new installation, but the Wubi Installer should automatically choose an installation size to accommodate the new OS. If you notice that Ubuntu is taking up too much space on your hard drive (or if you just don’t care for it) Wubi makes the uninstallation process easy as well. 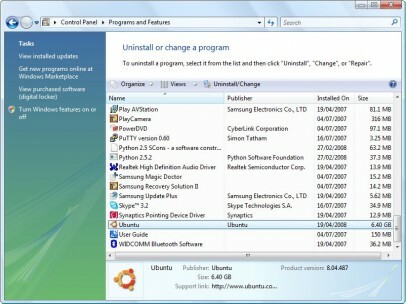 Navigate to Control Panel/Programs/Programs and Features to remove it just like any other Windows program. Trying Ubuntu has never been easier for Windows users, and most problems can be avoided by following the recommendations I listed above. I certainly encourage using Wubi to test drive Ubuntu because it is very safe and easy to use. Perhaps after trying Ubuntu, you’ll decide to take on a fully untethered installation in the future. Let us know if you’ve tried Wubi, or any other thoughts by commenting down below!